Most doctors offer their young patients lollipops to ease the sting of a shot. At the Family Health Center of Battle Creek, doctors have something much sweeter — in the form of a big, cuddly ball of fur named C.J. C.J. 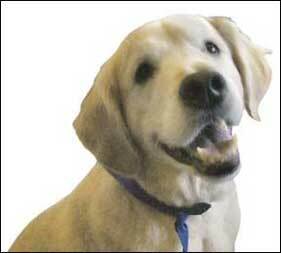 is a therapy dog at FHC, where he has lived since he was a puppy. The 7-year-old golden retriever works five days a week roaming through FHC providing comfort and joy — which is what his initials stand for — to patients of all ages. Battle Creek resident Cindy Davis-Jackson and her family go to FHC for dental and medical treatments. She said seeing C.J. is a huge treat for her granddaughter, Areonna Davis, 2. "I think having C.J. here is wonderful. It's therapeutic and calming," Davis-Jackson said. "Especially during dental appointments because you can get apprehensive and he kind of eases the tension." While wrapping C.J. in a bear hug, Areonna said that she likes C.J. because he is "pretty" and likes to pet and hug him because he is "soft and nice." C.J. 's duties range from sitting with small children — like Areonna — and letting them pet him while they are examined, to cheering up elderly patients with his arsenal of funny tricks. "There are many times where a child is getting a shot and they are hugging C.J. while they are getting it," said Janan Dunn, an administrative secretary at the center. "He is just so comforting and gentle with patients that it helps put people at ease." Dunn works closely with C.J. and has taught him most of his tricks. Some patient favorites are when he "says his name" by barking twice, making it sound like "C! J!," and "praying" for patients by bowing his head and placing his paws together. On an average day, C.J. arrives at work around 8 a.m. with Chief Operating Officer Janis Dillard, who he lives with when not at work. He settles in on his doggie bed in the administrative offices and waits to be called for duty. "He actually gets paged over the loudspeaker, like a doctor does," said A.J. Jones, president and chief executive officer of FHC. "He recognizes his name and jumps up and is ready to go help patients." Jones and Dillard first had the idea to bring a therapy dog to FHC nearly a decade ago, after a pediatrician showed Jones a news article about pet therapy. Dillard and Jones did some research on the benefits of pet therapy and decided to try it at the center. 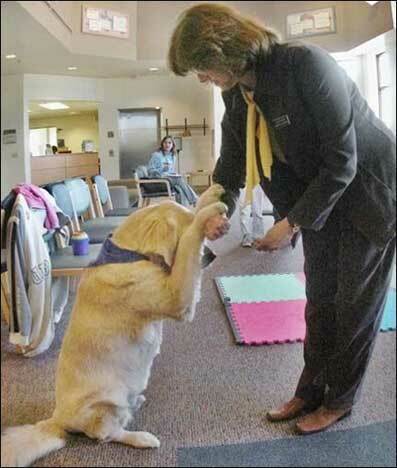 "A lot of patients we see here are emotionally challenged and a therapy dog can provide comfort and ease the stress of being at the doctor or dentist," said Becky Storey, the center's chief financial officer. "But he works with all types of patients, from the elderly to children." Jones said most dogs used in medical therapy are golden retrievers and Labrador retrievers because these breeds are generally mild-mannered, do well with children and like to be touched.Jones and Dillard began looking for golden retriever puppies to be tested as a therapy dog and they found a promising young puppy in Hastings. Specific tests for temperament, tolerance and gentleness were done on the pup, now C.J., and he passed with flying colors and a wagging tail. Janan Dunn of the Family Health Center has C.J. say his prayers for people at the center. Kevin Hare/the Enquirer Photo. "He had something special about him. He was so smart and friendly and he fit in right away," Jones said. "He's a natural in medicine." Unlike a seeing eye dog or companion animal, C.J. is not used to provide assistance or care for patients, but provides therapy by being himself. 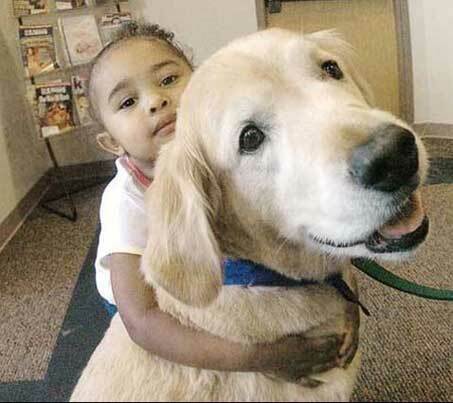 He greets patients, plays with them and sits with patients who are not feeling well. "He knows if people are scared or don't feel well and will come up to you and put his head on your lap," Jones said. "He has a great sense of how people are feeling." That sense includes knowing when to step back. Staff at FHC said that almost every patient loves C.J., but some are scared of dogs. C.J. is never pushy and allows people to come to him, staff members said. Even though C.J. lives with Dillard, the entire staff — and most of the patients — feel that C.J. is "their" dog. "We all take our turns taking him on walks," Storey said. "He helps the staff because he adds so much life and fun here. It helps us de-stress, too." Aside from comforting patients, C.J. acts as a mascot for FHC. He dresses up for every holiday and poses for postcards that are sent to parents reminding kids of check-ups. C.J. also makes public appearances with FHC. Though C.J. provides therapy to patients of all ages, he seems to have the most effect on children. "Sometimes I will take him with me in the car and he'll have his head out the window and kids will see him and call to him," Jones said. "He's a bit of a local celebrity to kids. He even gets kids writing him letters." Dunn said it makes her smile to see kids' eyes light up when they see C.J. "It's so funny to see kids run up to him in a waiting room and he'll have 30 little hands on him," Dunn said. "But he loves it. He just loves to be with people." Two-year-old Areonna's grandmother said her granddaughter doesn't really think about going to a doctor's office when she goes to FHC — she thinks about playing with C.J. "That's very common," Storey said. "Most parents don't tell their kids they are going to the doctor's. They say, 'We're going to see C.J.' instead." Stephanie Antonian Rutherford is a general assignment reporter. She can be reached at 966-0665 or srutherford@battlecr.gannett.com.